Question (from renzhe, Chinese forum): A true test of the system would be if you could devise the meanings of characters and words where you don’t know the meaning. … All you do is provide examples of the system in action on examples where you already know the answer, and each example uses a different explanation after you already know the answer. On June 5th 2008, Jason had a media test. Not only were there many chinese reporters but also teachers from chinese schools in the LA area, and anyone who is interested in chinese was invited to that meeting. I was one of the people who attended that meeting. As a member of Testing committee, I was able to sense the atmosphere of the meeting. Although all the Chinese reporters know the meaning of 尷 which does mean that someone doesn’t know how to act, however, none of them knew that the left radical meant humpback. After this first test word, it took a few minutes discussion among the reporters to come up with the second test word 靈 . Again after just a few seconds, Jason dissected this word as follows. The middle radicals are three mouths, meaning three or more persons. The bottom radical is shaman. Jason said that this word shows a scene of, at least, “3” shamans dancing for rain. It means channeling with rain spirits. Jason never did say that it means “spirit,” the fashionable meaning today. The top part is about plants. So, this word is either a name of a plant or something about plant. The middle part 執 means holding something with hand. The bottom part 云 means a great ability. In general, a plant’s name is often identified with one sound tag. As this word has two additional radicals, it might not be the name of a plant but must be something about or relating to plants. By decoding these parts, it must be a great ability handling plants. Again, Jason never did said that 藝 means art, the fashionable meaning today. While many Chinese reporters are looking at one another on deciding the validity of Jason’s answer, one Chinese scholar (Mr. Chou) said that Jason was correct as the original meaning of the word is about the great ability on farming. The left part is about the hand action. The right part is about practicing. So, it means a repeated hand action. Jason never did said that 摺 means folding, the fashionable meaning today. Jason did not know the fashionable meaning of those words. Jason gets the meaning of those words by a new method which is unknown to all Chinese reporters (more than a dozen) and to all Chinese scholars (more than 5 in the room). In fact, after the first two test words, I could sense the mood in the room among the Chinese reporters which had changed from shocking to praising. In their reporting (5 newspapers and 6 TV stations), they all reported their awe about the first test word 尷 . My study steps can answer this question or comment. It consists of the following steps. 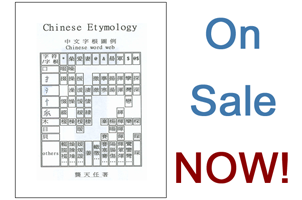 Step one: Learning 220 word roots from the text book Chinese Etymology. At this step, I was not allowed to learn any character. It took two days for this step. Step two: Under each word root, there are 4 to 10 characters which are composed of that word root plus other parts. My task is to dissect those characters by using the word roots, such as, 貸 is 人 + 匕 + 貝 . At this point, I was not allowed to learn the meaning of those characters.Note: Besides the word roots, the entire Chinese character set is constructed in generations. Generation 1 (G1) words are composed of from word roots or sound modules, and they must be the progenitors of many descendant words. In lesson one, it lists about 1,200 G1 words. It took 5 days to dissect 1,200 G1 words. Step three: In lesson two, it lists 300 sound modules, and it consists of three sub-lessons. Three hundred (300) sounds are encompassing 70% of all Chinese verbal sounds. However, I was not allowed to learn them at this point. The meaning of those three hundred sound modules (characters) are given, and I should learn them. Those 300 characters were dissected and decoded in the book, and I must learn them as examples of dissection and decoding of Chinese characters. Note: There are rules of dissection and decoding in the later lessons. However, I was not allowed to learn them at this step. I can only sense the two processes (dissection and decoding) from the examples of those 300 sound modules. It took a week (7 days) to complete this task. To re-dissect those G1 words. And it was clear to me that my first time dissection was far from what it should be. To read the meaning of each word with decoding by simply read the meaning of dissected parts. If I dissected it wrong, I can never decoding the meaning correctly, such as, dissecting 查 as 木 + 旦 , and we will be in a big trouble. At this step, I am not allowed to use dictionary to find out the meaning of the word before I did the dissection and decoding. It took 10 days to complete this task. Step five: I must look up the meaning of all (1,200) G1 words from a dictionary. Then, I must do two things. Was my decoding of the character matching with (or close to) the dictionary? If it is, I get one good point. If it is not, then I must find out who is wrong. Dictionary lists only the fashionable meaning, not the original meaning. Eighty percent of time, the dictionary (not 康 熙 dictionary) lists only the fashionable meaning, such as, 來 (coming), 豆 (beans), 斤 (pound), etc.. It took two weeks to complete this task. During these five steps, I “encountered” about 1,500 words (characters). The “key word” here is “encountering.” That is, I did not simply learn 1,500 words but am not encountering the other 57,000 words. When I encounter them, I should be able to dissect and to decode them. After these five steps, I should know all Chinese words regardless of whether I encountered them before or not. NOTE: If I learned a character without going through the process of dissection and decoding it would be wrong to this learning process. Question (from imron, Chinese forum): They were reporting on it yes, but it would seem as a special interest story rather than a thorough investigation of the world record attempt, and what it actually meant. If you are implying that those Chinese reporters are lacking journalist integrity, we think that it could happen for one or two such reporters. For all (more than a dozen) of them to be liars (in the sake of some interests) is way beyond our hearts to take. If it is the case, we are truly, truly, truly… sorry, although it is not a shame of ours. However, we are truly shocked that anyone can contemplating that all Chinese reporters (who attended Jason’s meeting) are crooks. It will be truly, truly sad even if this is only a remote possibility (crooked reporters). If imron truly believes that there is such a possibility, he should ask the editor-in-chief of those newspapers to investigate this possibility, and we will follow his lead to demand an answer. Indeed, we should act right now instead of throwing cheap shots to smear a third party in a discussion forum. Question (from imron): This is easily demonstrated by the fact that the majority of the Chinese media reports shown on the chinese-etymology.com site claim that this is a Guinness Record (???? ), when in fact it is not Guinness Records conducting or verifying the test but rather a self-styled World Record Committee. Jason has never claimed it to be a Guinness record. Our understanding was that Jason did contact Guinness Record. It replied that the key interest of Guinness is about the “reflect the general interest”. The World record of learning Chinese is neither in the scope of their interest nor in their ability to verify. After checking many times over, we did not find any news report which stated that Jason’s record “is” a Guinness record. They used two words, 創 (creating) or 破 (breaking). They reported that Jason was “trying” to 創 or to 破 Guinness record (of course, if there is such a record). Without such a Guinness record, any such a record is a 破 and a 創 relating to Guinness record. The bottom line is that not a single report stated that Jason’s record is or will be a Guinness record. Question (from roddy, Chinese forum): I also suggest he takes that world record thing down, as it’s a bit of an embarrassment. As the possibility that all Chinese reporters are crooks has been brought up, we could accept that Jason’s site is nothing but a hoax, putting up by some con artists, such as Chinese reporters, Chinese scholars (members of testing committee) and Jason himself. However, before the World Record Committee awarded Jason his World Record, we did invite the world to review and to challenge his work and claims, that is, he was and still is putting himself on the “spot” (the 的, 眾 矢 之 「 的 」 , the target of all arrows). Even if Jason were a con artist, he has the right to stand tall and high when he has the courage to be the 的 of all investigations. Note: from the posts of your discussion forum, we noticed that no member of that forum knows that 的 means the “target.” There is a Chinese idiom, 無 「 的 」 放 矢 (shooting without knowing the target). That is, that who does the 無 「 的 」 放 矢 should be embarrassed. In fact, many institutions did investigate into Jason’s work and claims. The Execute Yuan (行 政 院 ) of Taiwan did issue a directive to the Ministry of Education (教 育 部 ) of Taiwan to review Jason’s claim. Many American university presidents (Harvard, Yale, the UC system, USC, Cal State — Northridge, etc.) are directing their linguistics department to review Jason’s work. Dr. Chris Golston (Chair of Department of Linguistics, Cal State, Fresno) did challenge Jason. However, the Provost of the university (Dr. Jeri Echeverria) wrote a letter of apology right the way. The above facts and documents (their directives and letters) are available on Jason’s site. Under so many powerful reviews, Jason’s claim should stand before he is discredited. We think that the “embarrassment” belongs to those by throwing cheap shots. If we have no ability to discredit Jason ourselves, we, at least, can demand those powerful institutes (Taiwan government, Harvard University, Yale University, USC, etc.) to release their investigations as soon as possible. We are doing such demand right here and are asking you to join us to do the same in your future posts. Question (from renzhe, Chinese forum): It is widely known that characters are composed of parts and that parts of characters carry meanings and that other parts carry phonetic information. The 康 熙 leading radicals (部 首 ) were known for two thousand years. Can we read out the meaning of Chinese characters by using the 康 熙 radicals? Of course, you cannot. In fact, no one could. If anyone wants to argue this point with me, please decode the meaning of the following words with the 康 熙 radicals. 侯 、 候 、 修 、 倉 , they all have 人 as the 康 熙 leading radicals. With 康 熙 radicals, Chinese words can never be dissected correctly, and there is no chance to decode them correctly. In 1920s (during the May 4th movement), the slogan in China was 漢 字 不 廢 、 中 國 必 亡 (if not abandon Chinese character system, China as a nation will disappear from the Earth). Chinese character system was deemed as the culprit for China’s backwardness and high illiteracy rate at that time. This was why Chinese characters were simplified in 1958. If 康 熙 radicals allow Chinese character system to be learned in 90 days, then it had no reason to do the simplification. If you are a native Chinese and say that Chinese character system is easy to learn because that all characters are composed of parts, you will be the first person saying so, as all the great scholars during the 1950s in China did not know that. No, the fact that characters are composed of parts (especially in terms of 康 熙 radicals) will not make learning Chinese character system any easier. In fact, with the 康 熙 radicals there is no chance of any kind that we can dissect and decode Chinese characters correctly. Only a right set of word roots can lead to a right way of dissecting characters and a right path of decoding them. If you don’t know how to dissect a word correctly, you can never decode the meaning of that word correctly. Then, you must learn every character independently (not knowing it with a process), and it takes 4 to 5 school years for native Chinese children to learn 3,000 characters. Question (from renzhe): The problem is that you are using a secret system that claims all sorts of great things, and you don’t want to tell us what it is. Yes, we haven’t read the book, because the book costs $400. Obviously, you know that the text book I used is available on Internet. It is not a secret. It can also be found in some university libraries, such as, Harvard, Yale, Stanford, etc..
It’s Chinese edition can be found in some public libraries in California.